Male black-headed grosbeak. Photo by Julian Heavyside. At 21 cm long, the black-headed grosbeak is one of the larger songbirds. It has a distinctively large triangular bill with a dark upper half. Mature male plumage is the most distinctive: its black, white, and orange colouring is brighter than the similar but duller female and juvenile male plumage. The head, back, and wings of the female and juvenile are brown and white. Both have a light cinnamon-orange or buff front, though the juvenile male's tends to be richer and darker. Both the male and the female have yellow wing linings that are visible during flight. All About Birds describes the black-headed grosbeak song as a "tipsy robin welcoming spring." 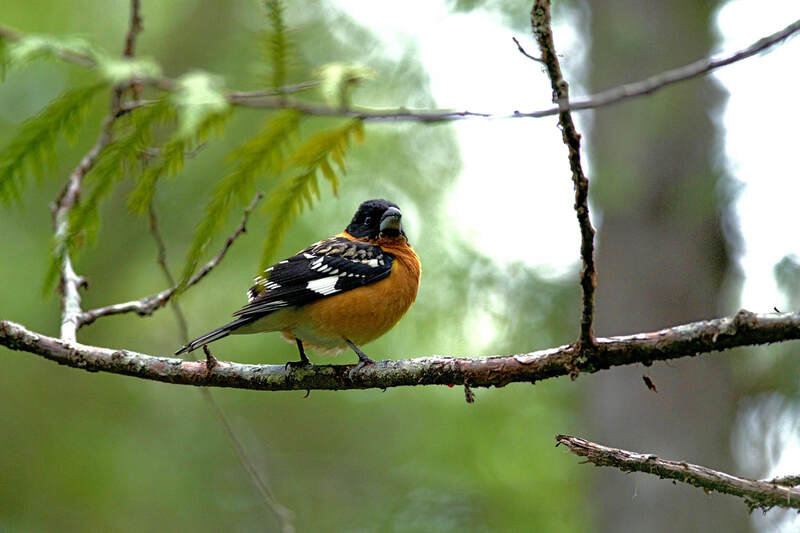 Look for the black-headed grosbeak in open areas with tall trees and a variety of understory foliage. It is often found in mixed, open forests and edge habitats like thickets, gardens, and forest edges. The Central Coast is a bit north of the black-headed grosbeak's usual summer range, which covers the western and central United States, and just barely gets into southern BC. It is found as far south as Central America in the winter and year-round. The male black-headed grosbeaks is similar in colouring to the spotted towhee, but the two species are very different in shape. The duller colour of the female black-headed grosbeak makes it easier to confuse with other species. The female rose-breasted grosbeak has prominent streaking on its breast, while the black-headed female may have light streaking near the wings. Look at the bill colour on these species as well: rose-breasted bills are pale, and black-headed bills are dark on top and light below. Black-headed grosbeaks are one of the only bird species that can handle the toxins found in monarch butterflies, and will feed on them in 8-day cycles in order to fully eliminate the toxins they have ingested. Black-headed Grosbeak. The Birds of North America Online (A. Poole, Ed.). Ithaca: Cornell Lab of Ornithology. Retrieved from the Birds of North America Online. Accessed 28/07/2013. Dunn, J. L. and Alderfer, J. (Eds.). (1999). National Geographic Field Guide to the Birds of North America. (3rd Ed.). Washington, D.C.: National Geographic Society. Pp. 428-429.